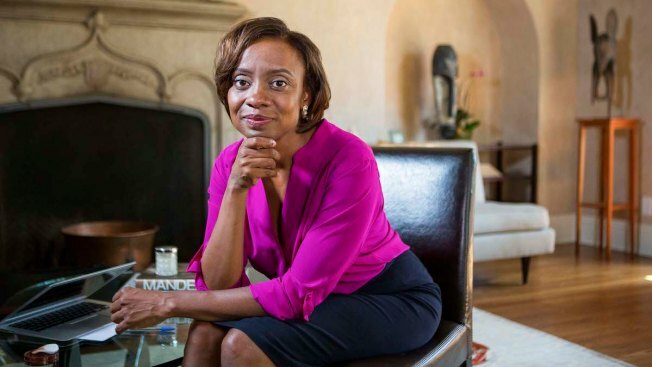 In this Sept. 8, 2014 photo provided by the John D. and Catherine T. MacArthur Foundation, social psychologist Jennifer Eberhardt poses for a portrait at Stanford University in Stanford, Calif. Eberhardt was named Wednesday, Sept. 17, 2014, as one of 21 people to receive a "genius grant" from the Chicago-based MacArthur Foundation. Her work prompted the Oakland, California, police department to ask for her help studying racial biases among its officers and how those biases play out on the street — topics that have been debated nationally in the wake of the police shooting of Michael Brown, an unarmed black 18-year-old in Missouri. Eberhardt, who is also studying the use of body cameras by police — another topic of particular interest since Brown's shooting — said, "I hope this will show the work matters, holds value and promotes social change." A former public defender, Rapping founded Gideon's Promise after seeing a legal system that he said valued speed over quality representation of the indigent. The organization trains, mentors and assist public defenders to help them withstand the intense pressure that can come with massive caseloads. The awards, given annually since 1981, are doled out over a five-year period. This year's class brings the number of recipients to more than 900. Shrouded in secrecy, the selection process doesn't involve applications. Instead, anonymous groups make nominations and recommendations to the foundation's board of directors. Most winners are not widely known outside their fields, but the list has over the years included such writers as Susan Sontag and Karen Russell and filmmaker John Sayles.